Even while we continue to emphasize discipleship, for the past half-century there has been a troubling relinquishment of the missionary calling of the Church. 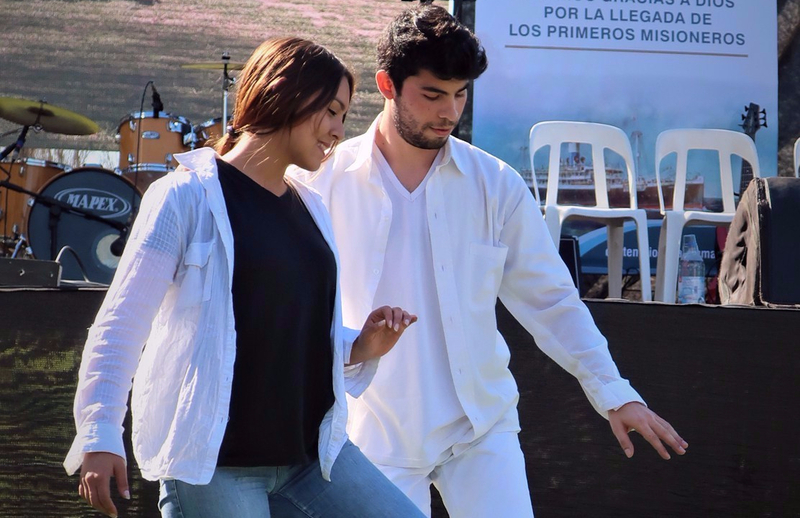 A youth drama troupe at the 100th anniversary celebration at Porto Madero mime the temptations and struggles that confront a young adult. Actor Laura Burgos with a Christ figure in white, played by Diego Gonzalez. Photo: MWC and J. Nelson Kraybill. In recent years, Anabaptists have been identified by such distinctives as peacemaking, voluntary choice, simple living, community and discipleship. We believe, however, that a key defining characteristic of the early Anabaptist movement was its fervent embrace of mission. Even while we continue to emphasize discipleship, we have muted the passionate, even sacrificial, commitment to evangelism that distinguished the early Anabaptists. For the past half-century, particularly in the north, there has been a troubling relinquishment of the missionary calling of the Church. In this context, the Mission Commission of MWC had a vision for a book: God’s People in Mission: An Anabaptist Perspective. The core of theological and missiological convictions, informally shared among the members of the Mission Commission, first led to an interest in developing a catalogue of those convictions that undergird and influence our foundations and approaches in mission. On March 24, 2014, after several years of yearning for a comprehensive statement of shared mission convictions, the MC adopted “Mission Theology Statements” at Dopersduin, Schoorl, Holland. This is a compilation of 10 missional convictions that articulate what we believe together about mission in the global Anabaptist community. We believe that further exploration of these convictions in a book-length form can help us think soberly about our essential identity as the missionary people of God. This is an urgent need. We hope that the reflections in each chapter will stimulate needed conversations and help us to align ourselves with God’s purposes for the reconciliation of all humanity and the restoration of the created order. In addition, we yearn that through these exchanges we will be revitalized by God’s Spirit for the mission that brought Jesus to our world. The desire of the MC is that God’s People in Mission: An Anabaptist Perspective might bring together diverse voices and experiences from within the varied contexts of our MWC global family. A number of the manuscripts were written in the different languages spoken by members of MWC. In the interest of ensuring wide accessibility, we hope eventually to have the text available in the three official languages of the MWC (English, Spanish and French). A further goal is to make the book available in several other languages spoken by members of the MWC. We are working hard to finish this book before our next meeting in Kenya 2018. Though the primary audience for the book is the MWC global family, we believe the book’s basic biblical-theological foundations and its contextual reflections can serve a wider audience. We hope it can serve diverse groups as a resource for study and reference for workshops, training, Sunday School classes and seminaries by creating and promoting spaces for dialogue, reflection, and commitments. We believe that every part of the MWC communion needs to recover the understanding that the church by its very nature is missionary. We understand from the Bible that God’s purposes find their essence and meaning in the mission of Jesus, and the work Holy Spirit is to advance this mission through the Church. Since God’s yearning is that all people experience salvation, the Church is called to be in mission on every continent until Jesus returns. Our prayer is that every member church in the MWC will be transformed for the missionary purposes of God.